This is my first actual post with the new nubbins, and I really had a hard time getting them all the same length. Call it length separation anxie. It took me a full week to get them all filed down, because each day I could only file them down a little at a time. Tonight I have another installment of Contrary Polish's Love Lyrics collection and this is called Feels Like Home. It's a smokey purple shade with itty bitty pink microglitter. I really love the combination of colors in this polish and I think it makes a wonderful office appropriate mani. The formula was minimally streaky and fairly opaque after the first coat, and I used two coats to even it out. I had no trouble with application and it went on very smoothly. It dried to a satin finish so I added a layer of Poshe for additional shine. I can't get over the contrasting microglitter in this polish and I can't help but wish there were more polishes out there. Luckily I managed to snag another similar polish from the same collection called The Way I Am which you can see here. I think this may be one of my favorite collection released this season because it isn't your traditional spring pastels. Have you managed to snag any of these yet? This is pretty and you're right, they're special. 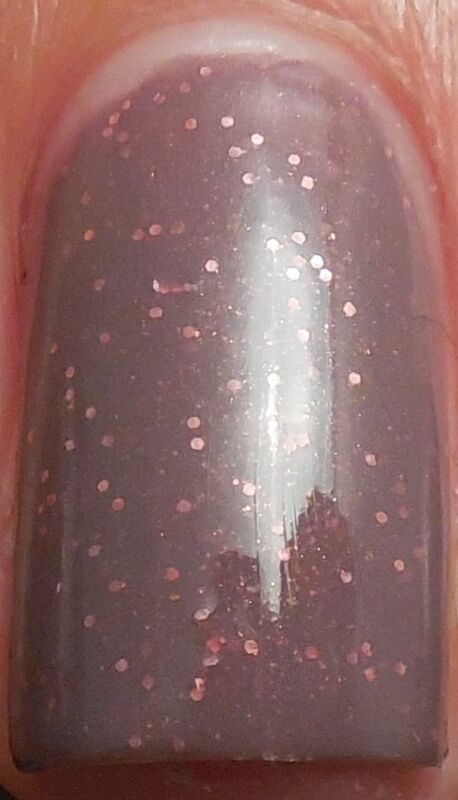 i love polishes that have microglitter/shimmer like this. i wish there were more!